Rheumatoid arthritis (RA) is a chronic inflammatory disease that causes a considerable burden for the patient and society. It is not clear yet whether aiming for remission (REM) is worthwhile, especially when compared with low disease activity (LDA). 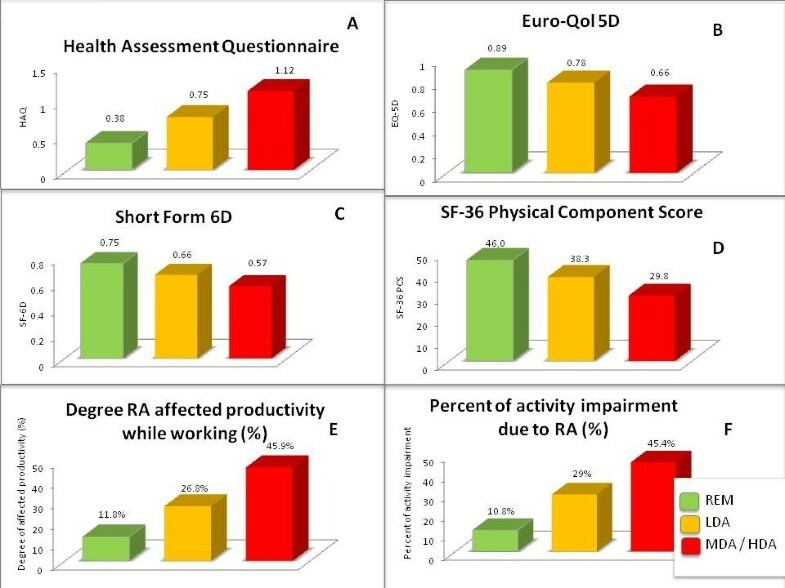 In 356 consecutive RA patients, we obtained data on physical function (health assessment questionnaire (HAQ)), health-related quality of life (HRQoL: Short Form 36 (SF36), Short Form 6 dimensions (SF-6D), Euro QoL 5D (EQ-5D)), work productivity (work productivity and activity impairment questionnaire (WPAI)), as well as estimation of direct and indirect costs. Cross-sectionally, data were compared in patients within different levels of disease activity according to the simplified disease activity index (SDAI; remission (REM ≤3.3); n = 87; low disease activity (LDA: 3.3 < SDAI ≤11); n = 103; moderate to high disease activity (MDA/HDA) >11 n = 119) by using analyses of variance (ANOVA). Longitudinal investigations assessed patients who changed from LDA to REM and vice versa. We found differences in patients achieving REM compared with LDA for HAQ (0.39 ± 0.58 versus 0.72 ± 68), WPAI (percentage impairment while working 11.8% ± 18.7% versus 26.8% ± 23.9%; percentage of overall activity impairment, 10.8% ± 14.1% versus 29.0% ± 23.6%)), EQ-5D (0.89 ± 0.12 versus 0.78 ± 0.6) and SF-36 (physical component score (PCS): 46.0 ± 8.6 versus 38.3 ± 10.5; mental component score (MCS): 49.9 ± 11.1 versus 47.9 ± 12.3) (P < 0.01 for all, except for SF36 MCS). Regarding costs, we found significant differences of direct and indirect costs (P < 0.05) within different levels of disease activity, with higher costs in patients with higher states of disease activity. Longitudinal evaluations confirmed the main analyses. Patients with REM show better function, HRQoL, and productivity, even when compared with another good state, such as LDA. Also from a cost perspective, REM appears superior to all other states. Rheumatoid arthritis (RA) is a chronic, inflammatory, destructive joint disease. RA is thus associated with major consequences for the individual, causing loss of function and work disability, and poses significant challenges to society, given its economic consequences. This socioeconomic burden of RA has been the focus of many studies and reviews, particularly in the more recent decades[1, 2]. Traditional and biologic disease-modifying antirheumatic therapies (DMARDs) may reduce this burden considerably[3–5]. The best clinical outcome of RA is the achievement of remission, a state of no or very little inflammatory disease activity. This state is linked to a total halt of progression of joint damage[6, 7] as well as to a maximally possible reversal of chronic disability. Because disability, as evaluated by measures like the health assessment questionnaire disability index (HAQ), is tightly associated with working capacity[9, 10], improving physical function not only will benefit the patient but also will improve major socioeconomic consequences of RA. Current therapeutic goals are aimed at achieving remission, but allow low disease activity as an alternative goal, recognizing that remission may not be reasonably achievable in most patients with RA, especially in established disease[11, 12]. Both of these states provide significant benefit to patients who have gone through the anguish of high disease activity. It is still unclear, however, whether better outcomes of the disease may compensate for potentially higher direct medical costs, particularly if expensive biologic therapies are involved[13, 14]. Moreover, it is unknown to what extent the presumed small step from low disease activity to remission is relevant regarding patient-reported outcomes and costs. It was therefore the purpose of the present study to investigate whether attaining a state of remission conveys a benefit when compared with low disease activity from a patient perspective, as well as from a socioeconomic point of view, by using a population of routine clinic patients. Cut points used to separate the states of remission, and low, moderate, and high disease activity are as follows: 2.8, 10, and 22 for CDAI; 3.3, 11, and 26 for SDAI; and 2.6, 3.2, and 5.1 for DAS28. Between May 2008 and March 2009, 356 consecutive consenting RA patients were included in our study. Patients were eligible if diagnosed as having RA by a rheumatologist, and no further inclusion or exclusion criteria were set forth to study a broad spectrum of typical RA patients, reflecting daily life. In addition to routinely performed assessments of disease activity, information regarding health-related quality of life (HRQoL), fatigue, and work productivity was obtained at consecutive visits. Furthermore, data on resource utilization and treatment costs were evaluated by a self-administered questionnaire to calculate direct costs for each patient. Indirect costs were deduced from the HAQ values, as described by Huscher et al..
First, we used the Short Form 36 (SF-36)[21, 22], a questionnaire comprising 36 items, organized into eight domains: physical function (PF), physical role (RP), bodily pain (BP), general health perception (GHP), vitality (VT), social function (SF), emotional role (RE), and mental health (MH); these domains can be further aggregated into two summary measures, the physical component score (PCS; including PF, RP, BP, and GHP) and the mental component score (MCS; VT, SF, RE, and MH). SF-36 results are normalized, and lower levels represent more impairment and thus worse outcome. Second, Short Form 6D (SF-6D) was assessed, which is a revised form comprising six domains (SF, PF, RE, BP, MH, and VT) and a total of 11 items of the SF-36. For our analyses, we used the standard (4-week recall version) German Version 1.0. The six dimensions each have between two and six levels. An SF-6D “health state” is defined by selecting one level from each dimension; a total of 18,000 possible health states can thus be defined. The SF-6D preference-based measure can be regarded as a continuous outcome scored on a 0.29 to 1.00 scale, with 1.00 indicating full health. Finally, we applied the Euro-QoL 5D (EQ-5D), which constitutes a preference-based measure comprising five domains with three levels ranging from −0.53 to 1.00, with 1.00 indicating perfect health. We used the Work Productivity and Activity Impairment Questionnaire (WPAI) consisting of six questions, to assess absenteeism and presence at paid work as well as in unpaid activity. We used the German-Austrian version of the WPAI-RA v2.0. WPAI outcomes are expressed as impairment percentages, with higher numbers indicating greater impairment and less productivity (that is, worse outcomes). To evaluate direct costs, resource use was recorded by using a questionnaire capturing the following items: inpatient stays at hospital and rehabilitation centers, surgery, imaging, and doctors’ visits. For cost of medication, only synthetic and biologic DMARDs were taken into account by using the reference costs as provided by the major healthcare provider for the Vienna area (Wiener Gebietskrankenkasse); other medical treatments (such as nonsteroidal antirheumatic drugs, glucocorticoids, and others) were not considered. Nondrug treatments like physical therapy were also evaluated. Furthermore, we collected data on costs of home adaptations, transportation, and home help that had been incurred by the patients. The items collected were based on a cost-effectiveness article and a systematic literature review on cost in RA[26, 27] and can be found in the supplement [see Additional file1]. All items were recorded for the 3-month period preceding the index visit and multiplied by 4 to estimate annual costs. Indirect costs were assessed by using the data of Huscher et al. on mean annual costs of sick leave within different levels of HAQ (HAQ ≤1.2, €856; 1.2 < HAQ ≤ 1.7, €3,212; HAQ > 1.7, €7,619); costs of work disability by using the human capital approach (HCA) and friction cost approach (FCA)[29, 30] were also estimated (HCA, HAQ ≤1.2, €4731; 1.2 < HAQ ≤ 1.7. €12,707; HAQ >1.7, €18,894; FCA, HAQ ≤1.2, €752; 1.2 < HAQ ≤ 1.7, €2,019; HAQ > 1.7, €3,002). The FCA in contrast to the HCA takes into account that no economy achieves full employment and that productivity losses are counted only until a person previously unemployed replaces the productivity of persons who lost their work. In FCA, this time period is set to 58 days[29, 30]. For cross-sectional analyses, we divided patients according to their levels of disease activity by SDAI into remission (REM SDAI ≤ 3.3; low disease activity (LDA) 3.3 < SDAI ≤ 11; moderate disease activity (MDA) 11 < SDAI ≤ 26; and high disease activity (HDA) SDAI > 26). We assessed the univariate relation between outcomes of HRQoL, productivity, fatigue, functional disability, and disease activity by Spearman correlation. With analyses of variance (ANOVAs), we investigated whether these outcomes were significantly different at different levels of disease activity defined by SDAI. Sensitivity analyses were performed by using CDAI and DAS28 as alternative composite measures of disease activity. To account for potential confounders, we extended ANOVA and performed a General Linear Model (GLM), including disease duration, as a covariate in the model. With a GLM, we were able to calculate estimated marginal means (EMMs), which depict the mean for each level of disease activity, adjusted for any variable used in the model. For sensitivity analyses, we divided our patients into two groups: early RA, disease duration ≤2 years; late RA, disease duration >2 years; and rerun ANOVA within those two groups. Differences in costs between different levels of disease activity were compared by using a Kruskal-Wallis test. In a final longitudinal analysis, we investigated whether patient-reported outcomes differed significantly in those patients who improved from LDA to REM, or who worsened from REM to LDA, by using a Student t test. The patients involved consented to take part in the study, and the study was approved by the Ethics Committee of the Medical University Vienna. The Statistical Package for the Social Sciences (SPSS, Version 19) was used to conduct the analyses. In total, 716 visits of 356 patients were documented; the median was two visits per patient (range, one to four); 209 patients had at least one follow-up visit within the time frame of this study (that is, 1.4 years). Patients’ characteristics at the baseline visit are depicted in Table 1. Values reported as means ± standard deviation, unless indicated otherwise. Patient-reported outcomes of functional disability, HRQoL, productivity, and fatigue correlated significantly with disease activity according to SDAI, CDAI, and DAS28. The highest correlatio n was found between disease-activity scores and outcomes of functional disability (HAQ r = 0.54, 0.53, 0.53; SF-36 PCS r = −0.58, -0.56, -0.55; for SDAI, CDAI and DAS28 respectively, P < 0.01), as well as the ability to perform regular daily activity (percentage activity impairment, r = 0.52, 0.54, 0.56; for SDAI, CDAI, and DAS28 respectively, P < 0.01), whereas only a low correlation was seen between disease-activity scores and mental function (SF-36 MCS r = −0.15, -0.19, and -0.20, respectively, P < 0.01). Furthermore, HRQoL and fatigue correlated significantly with disease-activity measures (SF-6D r = −0.46, -0.47, -0.47; EQ-5D r = −0.51, -0.51, -0.48; VAS fatigue r = 0.45, 0.44, 0.45, respectively, p < 0.01). In currently employed patients, a good correlation was observed between “percent impairment while working due to RA” and disease activity (r = 0.51, 0.54, 0.56; for SDAI, CDAI and DAS28, respectively; p < 0.01), “percent overall work impairment due to RA” (r = 0.53, 0.53, 0.54, p < 0.01), and “percent work time missed due to RA” (r = 0.34, 0.34, 0.24, respectively, p < 0.01). Looking at states of disease activity according to SDAI at the baseline visit, 24.4% (n = 87) were in REM, 42.1% (n = 150) in LDA, 28.9% (n = 103) in MDA and 4.5% (n = 16) in HDA. Given the small number of patients in HDA, we combined patients with MDA and HDA for further analyses. Comparing functional disability by HAQ at the three levels of disease activity, we observed significant differences between REM, LDA and MDA/HDA (by SDAI), showing a HAQ increase with increasing disease activity. These results were not only obtained for the total HAQ-score (mean ± SD: REM 0.39 ± 0.58; LDA 0.72 ± 0.68; MDA/HDA 1.24 ± 0.75; (Figure 1A), but also for the different domains of the HAQ (Figure 2A). Analyses of variance. Panels depict significant differences of mean scores of Short-Form 6D (A), Euro-QoL 5D (B), Health Assessment Questionnaire (C), Short-Form 36 Physical Component Score (D), mean percentage of degree RA affects you while working (E), and mean percentage of activity impairment while working (F) within levels of disease activity determined by SDAI (remission REM ≤ 3.3; 3.31 < low disease activity (LDA) ≤ 11; 11.01 < moderate to high disease activity (MDA/HDA)). 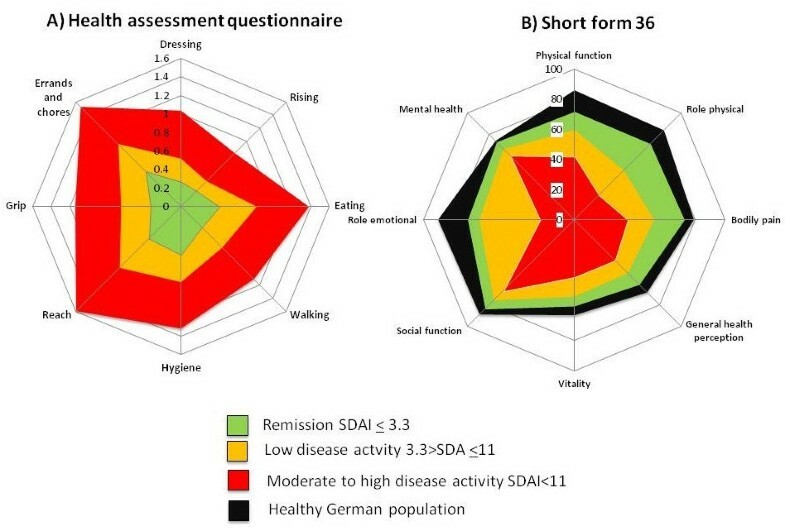 Analyses of variance: Significant differences of different domains of Health Assessment Questionnaire (HAQ, A) and SF-36 physical component Score (PCS, score of 0 indicates poorest status, and 100 indicates best status; B) among levels of disease activity determined by SDAI (remission REM < 3.3; 3.31 < low disease activity (LDA) < 11; 11.01 < moderate to high disease activity (MDA/HDA)). Again, similar findings were obtained in a sensitivity analysis when assessing disease activity states by CDAI (mean ± SD HAQ: CDAI-REM 0.38 ± 0.56; LDA 0.75 ± 0.70; MDA/HDA 1.23 ± 0.74; p < 0.01) and DAS28 (HAQ mean ± SD: REM 0.46 ± 0.62; LDA 0.60 ± 0.66; MDA/HDA 1.24 ± 0.74; p < 0.01); however, the difference between HAQ-values in DAS28 REM and DAS28 LDA were not significant for the total HAQ score nor for the individual domains (data not shown), presumably because – in line with previous observations[31, 32] - some patients in DAS28 REM have significant residual disease activity reducing the difference between the REM and LDA states by this score; indeed, HAQ and other values in DAS28 REM were numerically higher than those seen in the more stringent CDAI and SDAI remission criteria. 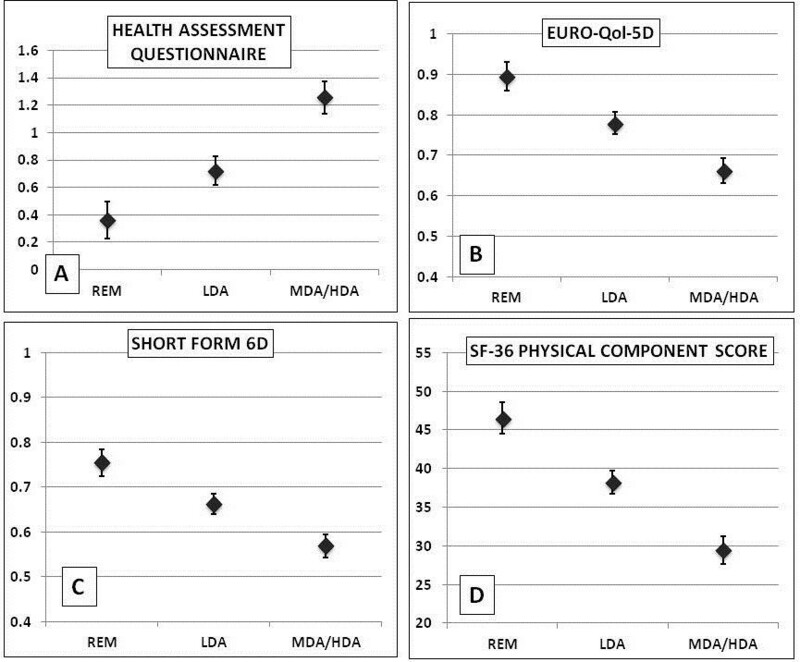 Assessing functional disability using the physical component score (PCS) of SF-36, we also found significant differences between the different levels of disease activity (SDAI-REM: 46.0 ± 8.6; LDA: 38.3 ± 10.5; MDA/HDA: 29.8 ± 9.2; p < 0.01). For the mental component score there were only subtle differences between disease activity states, but still a small trend toward better outcomes with lower disease activity (mental component score: SDAI-REM: 49.9 ± 11.1; LDA, 47.9 ± 12.3; MDA/HDA: 46.6 ± 12.3; P = 0.06). Significant differences were seen for all individual PCS domains of SF-36 between different levels of disease activity (Figure 2B). When directly comparing LDA with REM, a significant difference was observed in the PCS of the SF-36 and in all domains except role emotional. Nevertheless, even when comparing RA patients in REM with a healthy German population, we did find significantly lower mean values for most domains (all except SF and MH; Figure 2B). When we assessed potential differences in HRQoL by other measures, such as EQ-5D and SF-6D, we found very similar results, namely decreasing HRQoL with increasing levels of disease activity. For EQ-5D, the mean values ± SD were in SDAI-REM 0.89 ± 0.12, in LDA 0.78 ± 0.16 and in MDA/HDA 0.66 ± 0.21 (P < 0.001) (Figure 1B); for the SF-6D, the results were in REM, 0.75 ± 0.15, in LDA, 0.66 ± 0.14, and in MDA/HDA, 0.57 ± 0.12 (P < 0.001) (Figure 1C). Of note, the mean differences of patients in LDA by SDAI when compared with MDA/HDA were almost identical to the difference between REM and LDA. In sensitivity analyses, we used CDAI and DAS28; in line with the previous results, these data showed significant differences between different levels of disease activity (CDAI SF-6D, mean ± SD: REM, 0.75 ± 0.15; LDA, 0.66 ± 0.13; MDA/had, 0.57 ± 0.12; CDAI EQ-5D, REM, 0.89 ± 0.12; LDA, 0.78 ± 0.16; MDA/had, 0.66 ± 0.21; DAS28 SF-6D: REM, 0.74 ± 0.15; LDA, 0.69 ± 0.14; MDA/had, 0.58 ± 0.12; DAS28 EQ-5D: REM, 0.88 ± 0.13; LDA, 0.81 ± 0.17; MDA/had, 0.67 ± 0.20; P < 0.01 for all analyses, respectively). When extending ANOVA to a General Linear Model (GLM) that allows adjustment for disease duration, we again found significant differences (P < 0.01) of mean HAQ, SF-6D, EQ-5D, and PCS values between patients in REM, LDA, and MDA/HDA (estimated marginal mean (EMM) and 95% confidence interval are shown in Figure 3A through D). General linear model adjusted for disease duration 11.34 years). (A) Estimated marginal means (EMM) of Health Assessment Questionnaire for patients within remission (REM), low disease activity (LDA), and moderate to high disease activity (MDA/HDA) of an RA patient with 11.34 years of disease duration. (B) EMM of Euro-QoL 5D of respective patients. (C) EMM of Short Form 6D; (D) EMM of Short Form 36 physical component score. Each model showed significant differences (P < 0.01) of respective outcomes within patients of different levels of disease activity determined by simplified disease activity index (SDAI). In additional sensitivity analyses, we divided patients into two groups according to their disease duration: early RA (disease duration ≤2 years; n = 58) and established RA (disease duration >2 years, n = 298). Again, significant differences of HAQ, SF-6D, EQ-5D and PCS values were found between different levels of disease activity; in early as well as established RA patients (Table 2); notably, patients with established RA had worse levels in most measures compared with those with early RA. EQ-5D, Euro Quality of life 5 dimensions; HAQ, Health Assessment Questionnaire; LDA, low disease activity; MDA/HDA moderate disease activity/high disease activity; RA, rheumatoid arthritis; REM, remission; SF-6D, Short Form 6 dimensions; SF-36 PCS, Short Form 36 Physical Component Score. In our cohort, 92 (26%) patients were currently employed; the majority were already retired (n = 209). Among the latter, 34% (n = 72) were in early retirement due to RA; 14 patients were unemployed; five of them specified that they were unemployed due to RA. Other work statuses reported: student (n = 3), maternity leave (n = 1), house wife/husband (n = 28); nine patients did not report anything. Among currently employed patients, 30.4% were in SDAI REM (n = 28), 44.6% in LDA (n = 41) and 25% (n = 23) in MDA/HDA. With WPAI, we found significant differences in the “degree RA affected productivity while working” between levels of disease activity (%; mean ± SD): REM, 11.8% ± 18.7; LDA, 26.8% ± 23.9; MDA/HDA, 45.9% ± 28.6; P < 0.001; Figure 1E) and the percentage of activity impairment due to RA (mean + SD: REM, 10.8% + 14.1; LDA, 29.0 + 23.6; MDA/HDA, 45.4 + 25.0; P < 0.001; Figure 1F). No significant difference in absenteeism was found (percentage of work time missed because of RA) or the percentage of overall work impairment because of RA, although a numeric increase of work time missed and impairment was observed with increasing level of disease activity (data not shown). When comparing mean total direct costs between the three disease-activity states, we found significant differences (P = 0.05, ANOVA) and a similar trend regarding resource utilization (P = 0.06). Treatment costs were relatively similar across the different levels of disease activity (Table 3), with slightly higher costs in higher levels of SDAI. We also observed differences between REM, LDA, and MDA/HDA when comparing estimated indirect cost (Table 3) with significantly higher indirect costs due to sick leave and work disability in patients with higher levels of disease activity (P < 0.01). FCA, friction cost approach; HCA, human capital approach; HDA, high disease activity; LDA, low disease activity; MDA, moderate disease activity; REM, remission. Treatment costs include patients treated with biologic agents (overall, 36.2%. The distribution among different levels of disease activity was equal: REM, 32.2%; LDA, 36%; MDA/HDA, 39%). Within the period of observation (mean, 6.5 months), 23 patients changed their disease-activity states from LDA to REM. When investigating the changes in physical function, we saw significant improvement of HAQ from 0.61 ± 0.7 to 0.51 ± 0.7 (P = 0.005). Moreover, even though patients in LDA had already reached a relatively good outcome, fatigue improved from a score of 3.7 ± 2.1 to 2.9 ± 2.1 (P = 0.037). When we looked at whether, contrariwise, effects could be found in patients who shifted from REM to LDA (n = 22), HAQ indeed deteriorated significantly (REM, 0.4 ± 0.4; LDA, 0.5 ± 0.4; P = 0.014). We found no change in HRQoL or productivity in this situation (results not shown). In this study, we observed significant differences in functional disability, health-related quality of life, fatigue, and work productivity between different levels of disease activity, showing an increase of functional impairment and fatigue and a decrease of work productivity and health-related quality of life with worsening disease-activity states. Although it was not surprising to find major differences between higher and lower states of disease activity, the major finding of our study relates to the significant differences between LDA and REM across all variables assessed: physical function, health-related quality of life, work capacity, and costs. Moreover, these findings from cross-sectional analyses were also supported in a small group of patients that allowed the longitudinal changes when moving from LDA to REM and vice versa. Recently, new treatment recommendations have been published, taking into account economic aspects of treatment options in RA. A systematic literature review published in 2010 indicated that treatment strategies leading to maintenance of physical function and keeping patients at work are cost effective, even when including more-costly biologic agents. Even though leading to a significant increase of medical costs, biologic agents can substantially improve disease activity and reduce progression of joint destruction[34–41], especially in patients at high risk to develop these. Treating rheumatoid arthritis to the target of remission has been proposed to constitute an optimal therapeutic goal. However, whereas low disease activity constitutes an alternative goal, especially in patients with longstanding disease, only insufficient data exist on whether the socioeconomic implications of low disease activity are similar to or different from those of remission. Answering this question will ultimately be the driver of the decision whether it is worthwhile aiming for remission in patients who already have reached an acceptable clinical state: low disease activity. In our study, we showed that in all aspects of patient-reported outcomes, remission is superior to low disease activity, regardless of the index used. Furthermore, we observed that even in patients who already had reached low disease activity, an improvement of these outcomes was seen upon reaching remission. It is noteworthy that patients in REM on average did not reach normal health-related quality of life values, which contrasts with other findings. This is presumably due to the long disease duration of our patients (mean of about 11 years) and thus the accrual of irreversible damage and disability. However, this might also make the findings even more significant. Several limitations of our study should be addressed. First, the evaluation of indirect costs was estimated by using previously published cost analyses rather than self-evaluation of sick-leave and work-disability costs. Although several studies have revealed that functional disability is highly correlated with and a major predictor of indirect costs, these estimated costs should be regarded as a guidance value rather than an individualized cost calculation. Conversely, by using the WPAI, we could substantiate our findings, showing an increase of “degree RA affected productivity while working” with increasing level of disease activity. Because of recall bias, we did not ask patients to report the whole previous year but only 3 months, and to explore costs for a whole year by multiplying it, which is only an approximation of the actual costs and resource utilizations. The fact that only about 26% of our population was currently employed might overestimate the findings on productivity, although the percentage reflects a typical RA cohort. We must address that we found a significantly lower percentage of overall work impairment due to RA when compared with results of other studies[25, 43]. Therefore, the results on work impairment must be interpreted with caution and might not be generalizable and assignable to other cohorts. Second, when assessing direct medical costs, we reported only costs due to synthetic or biologic DMARDs but disregarded costs due to other medications, such as glucocorticoids, NSAIDs, or drugs used to treat RA-related comorbidities. Third, we studied only relatively few patients longitudinally; however, despite this small number, the differences between LDA and REM were statistically significant in both directions (improvement from LDA to REM and deterioration from REM to LDA) and thus support the cross-sectional analyses. Still, further research is needed, to strengthen and validate our longitudinal findings, that going from low disease activity to remission leads to significant improvement of important outcomes like physical function, but also HRQoL or productivity. The finding that when using DAS28, HAQ levels in REM and LDA did not differ significantly, does not decrease the validity of the results. Because DAS28 remission is not sufficiently stringent, and given the low range of values for classification of a DAS28 LDA state, the similarity of results between REM and LDA when using DAS28 is not surprising. Thus, our focus on the more-stringent SDAI remission, which constitutes the ACR-EULAR index-based remission definition, allowed recognition of the differences between REM and all other states, including LDA. Also, the fact that our study relates to the inclusion of a large sample of clinic patients with a broad range of disease activity, disease duration, treatment strategies, and comorbidities, rather than more homogeneous trial populations, allows insights into the routine care of RA patients. Of additional importance, our analyses revealed that LDA is a much better state than MDA/HDA in all respects: physical function, health-related quality of life, and productivity. Thus, indeed, LDA is a good alternative option for patients in whom remission cannot be reached either due to their long-standing, refractory disease or to the inability to intensify therapy due to comorbidity, contraindications, or patient preference. Therefore, although the present data unequivocally support the value of reaching remission and should be used in counseling patients and rheumatologists on the importance of assessing disease activity and targeting stringent remission where this goal is achievable, they should not be used to justify intensification of treatment where only a little is to be gained or risks prevail. Reaching remission seems to be a desirable state from patients’ as well as socioeconomic perspectives. Patients in remission appear to have higher health-related quality of life, better physical function, and greater work capacity compared with those with low disease activity. From an economic perspective, the direct as well as the indirect costs are lower in patients attaining remission compared with those in higher states of disease activity, even including low disease activity. Therefore, aiming for remission remains the ultimate goal when treating RA patients, but a decision for which efforts will be used to move patients from low disease activity to remission will require careful considerations, based not only on patient preferences and contraindications, but also on cost thresholds that society will have to define. The authors thank Tanja Stamm and her team for their help in recruiting patients and fill in the questionnaire. The study was supported in part by a grant from UCB (Belgium). The authors declare that they have no competing interests. HR provided conception and design, data collection, performance of all statistical analyses, manuscript writing, and final approval of the manuscript. JS participated in conception and design, manuscript writing, and final approval of the manuscript. DA provided conception and design, manuscript writing, and final approval of the manuscript. All authors reviewed the manuscript before submission and approved the final version.